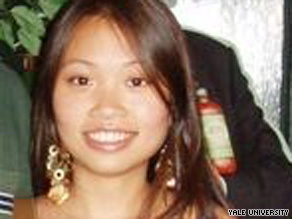 (CNN) -- Investigators found the remains of a woman they assume is missing Yale graduate student Annie Le, a senior police official said Sunday. Annie Le, 24, has not been seen by family, friends or co-workers since Tuesday, police say. The remains were found inside a wall at 10 Amistad Street, said Peter Reichard, New Haven, Connecticut, assistant police chief. "She hasn't been positively identified, however, we are assuming that it is her at this time so we are treating it as a homicide investigation," Reichard said. Investigators said they had spoken with students and others in the building who confirmed she was there. Police discovered the body in the basement Sunday afternoon, said Yale University President Richard Levin in a statement to the campus community. Police plan to work through the night to remove the unidentified body, which is still in the wall, police spokesman Joe Avery told CNN. Le, 24, was to be married Sunday in Long Island, New York. Her fiance, Jonathan Widawsky, is a graduate student at Columbia University in New York. "Our hearts go out to Annie Le's family, fiancé and friends, who must suffer the additional ordeal of waiting for the body to be identified," Levin said. "I have met again with her family and conveyed to them the deeply felt support of the Yale community." Investigators probing the disappearance of the pharmacology student earlier were testing bloody clothes found hidden in ceiling tiles in the Yale building, a law enforcement source told CNN. The bloody clothes are among the potential evidence being tested. William Reiner of the FBI's New Haven office said Sunday that investigators are searching a waste facility that normally handles garbage from the Yale lab. He described it as a routine step. "In a situation like this, it's common for us to follow the trash," Reiner said. The search was taking place at the Connecticut Resources Recovery Authority landfill in Hartford, near New Haven.